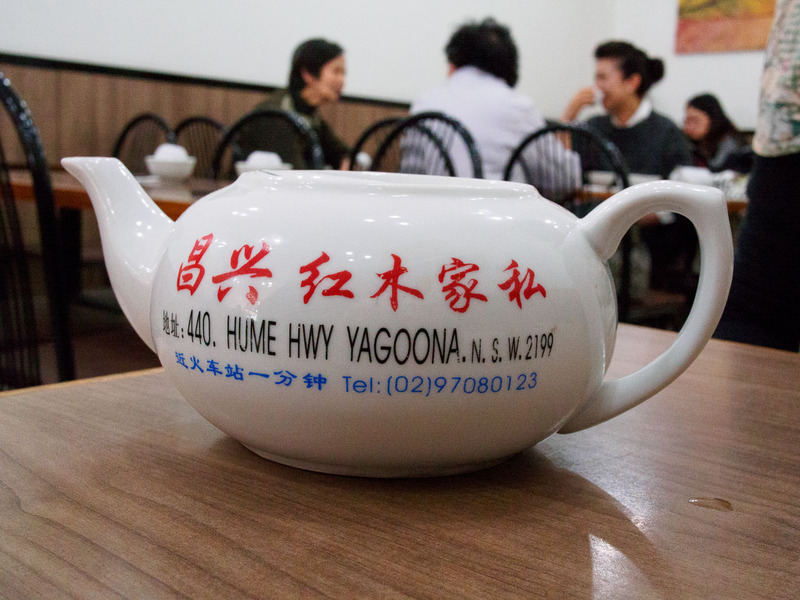 Ashfield is the home to a record number of restaurants with the word 'Shanghai' in the name. 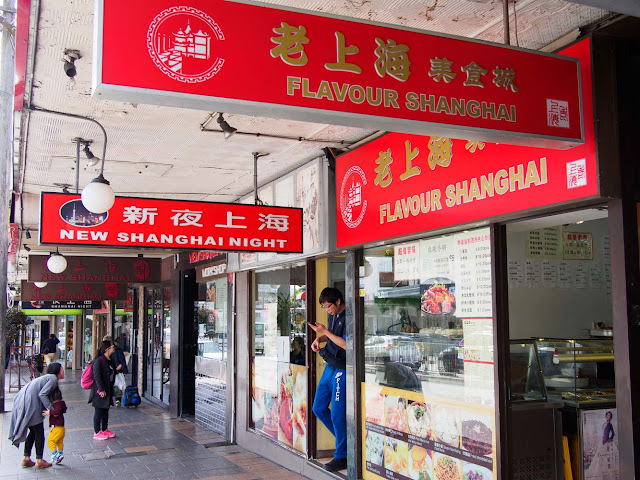 Flavour Shanghai might be the smallest, but the flavour is indeed large. 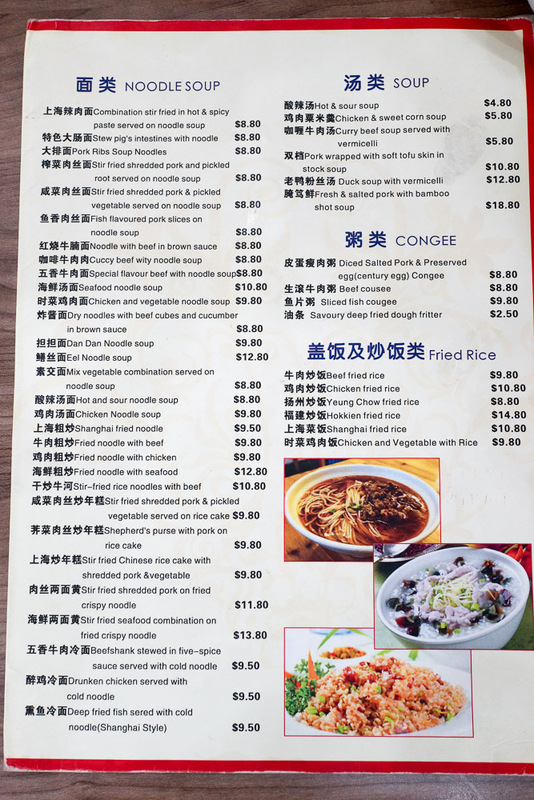 There must be a law in Ashfield decreeing that every Chinese restaurant along Parramatta Road must have the word 'Shanghai' in its name. 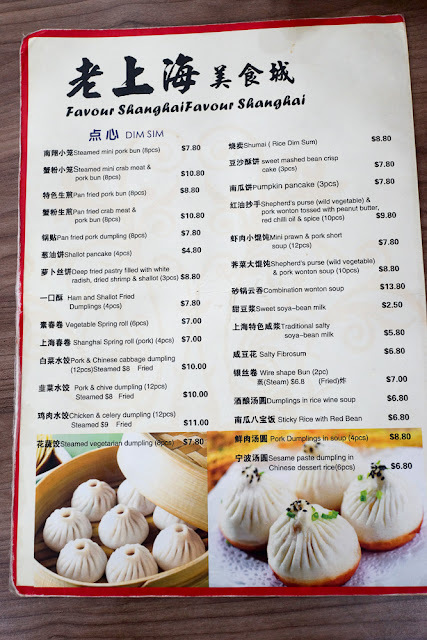 There's Shangahi Night, New Shanghai, New Shanghai Night (why not combine two names in one), Taste of Shanghai, Shanghai Dumpling and the smallest of all the Shanghai's, Flavour Shanghai. This narrow store with basic table and chairs is wedged between the other Shanghai restos, by far the most humble and b-kyu of the lot. Once you have passed the bain-marie-of-love inside the front entrance and seated, you are served Chinese tea from the 'why hasn't anyone thought of using this as advertising space before' special tea pot. 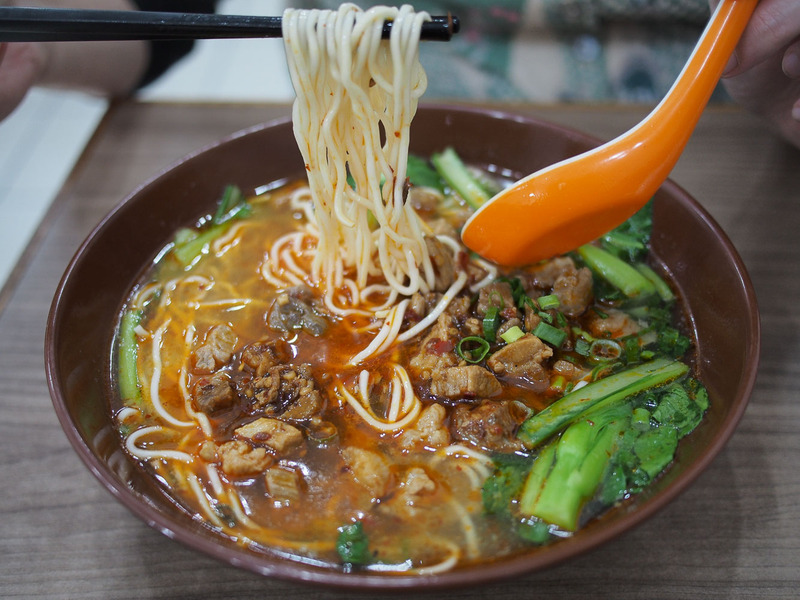 We find joy here in the large bowls of noodle soups. They are steaming hot, generous and super filling. 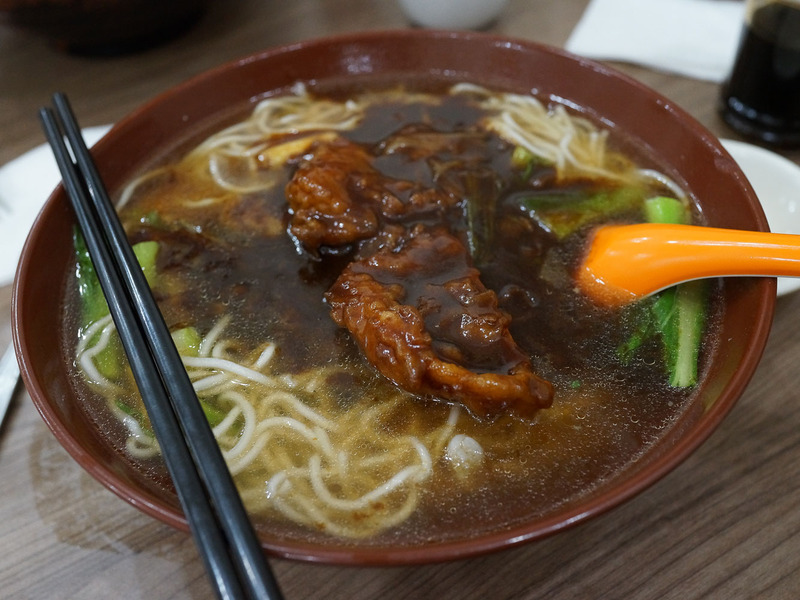 The stew pig intestine with noodle ($8.80) has a suitably funky whiff, with the pieces of meat in a slightly chilli gravy which adds depth to the broth as you sip through. The thin wheat noodles are perfect with this style of soup. 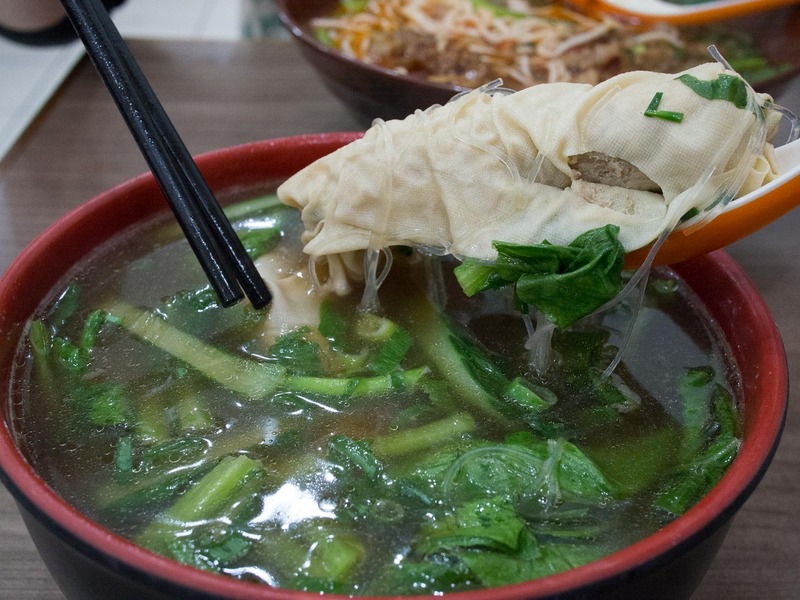 Underneath were bundles of soft pork mince wrapped in soft tofu skin, with spider web like vermicelli noodles. 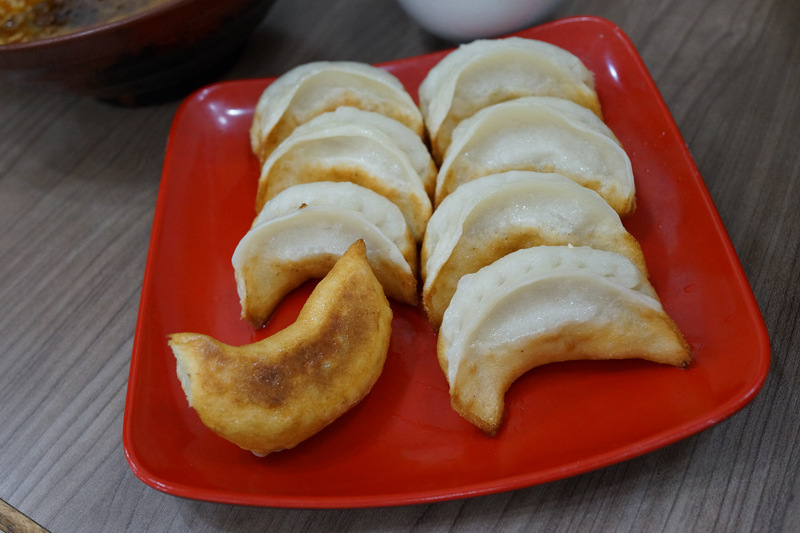 The texture of these unusual dumplings was a little firm at first as you bit through the tofu, then soft as you came to the meat. A really intriguing texture that worked a treat. 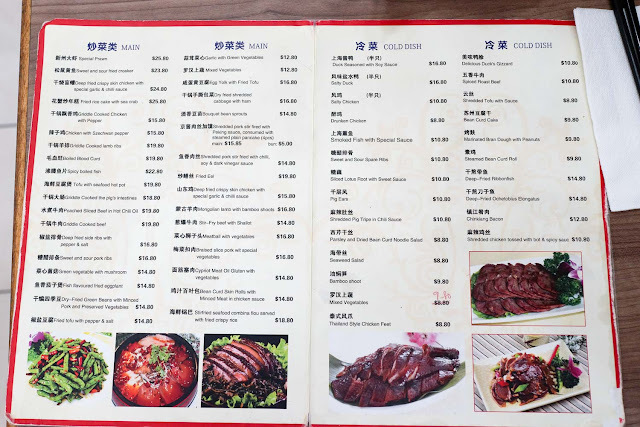 If you are a fan of birds with a drinking problem, then the drunken chicken served with cold noodle ($9.50) could be the dish for you. The chicken is poached with a flash of cooking wine and served cold on a bed of noodles. The sauce is a peanut-sesame mix that adds extra flavour and punch. Dan Dan noodle soup ($9.80) is hearty and mighty. 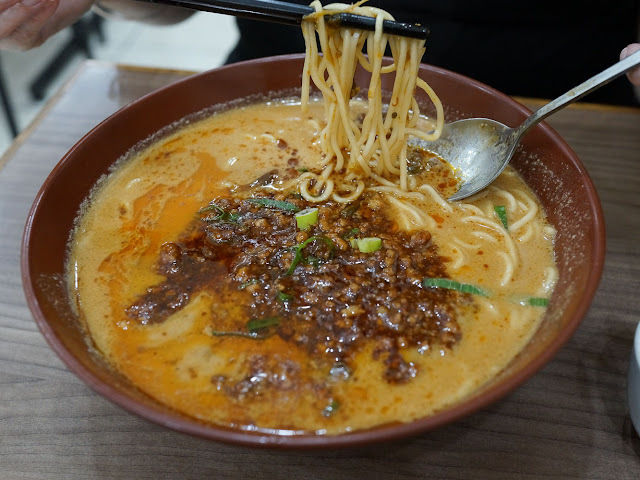 The chilli hit is mixed into the pork mince sauce, while the sesame paste broth hold more heat. 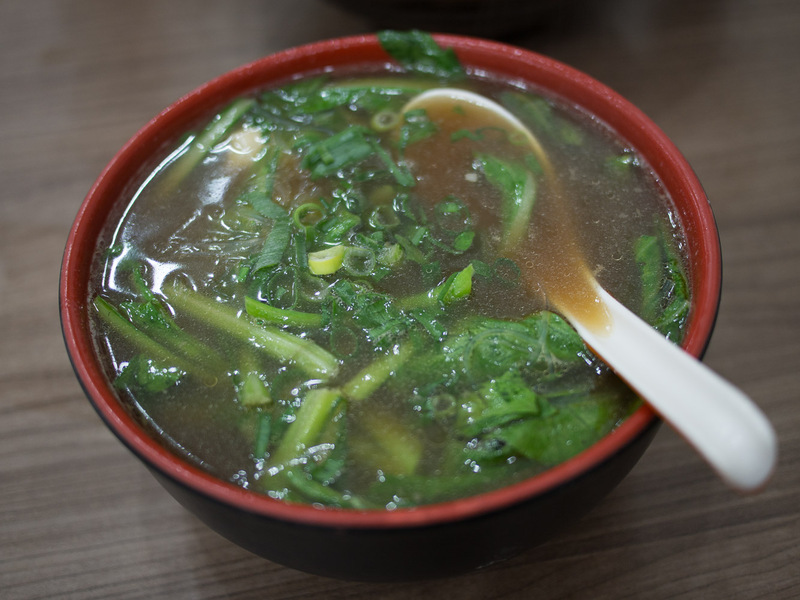 This is a big bowl of thick soup, so attempt when only really hungry. 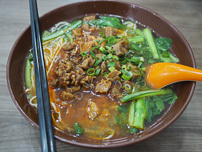 Pork ribs soup noodles ($8.80) is another large bowl of noodle soup, this time with generous sized portions of fried pork. The thick brown sauce holds at first, but slowly disintegrates into the broth as you sip. For more than just a noodle soup, the pan fried pork bun ($8.80 for 8) helps your meal expand your waistline even more. Don't forget to double dip from the bain-marie-of-love at the front, take home some containers of cold cooked dishes to have later. 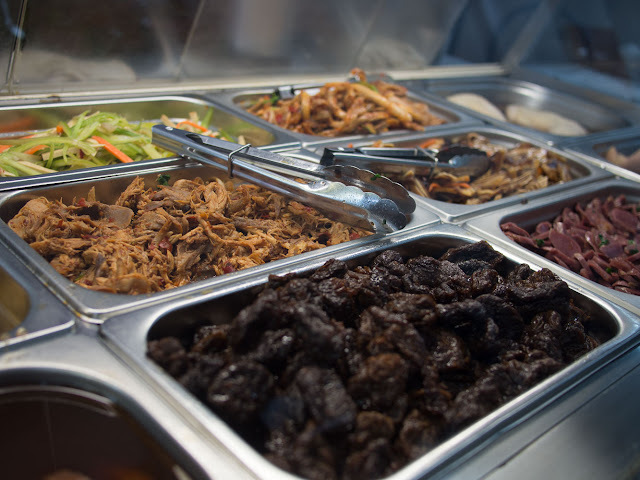 We're partial to the fresh shredded tofu skin and celery salad, shredded pigs ear and the large meatballs. 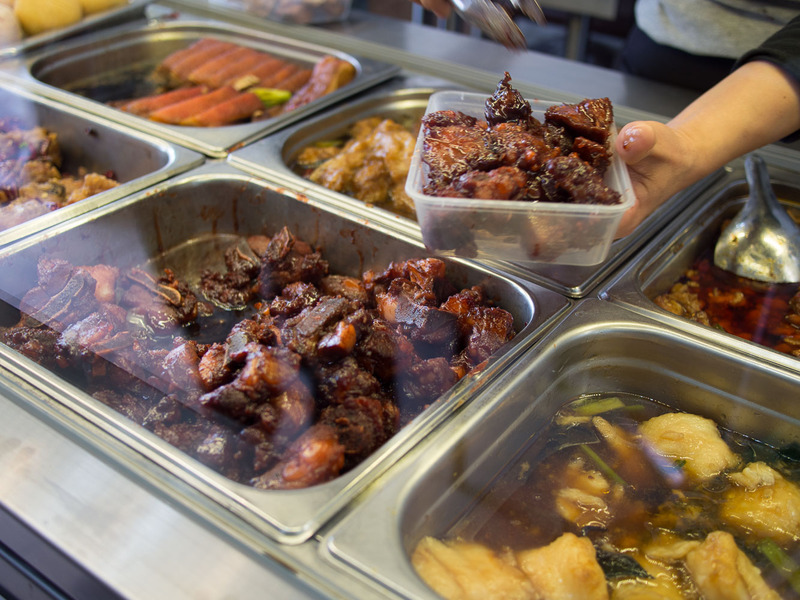 This time we pick up some sweet and spicy pork ribs for dinner later on tonight. Some rice and veg and we are set. 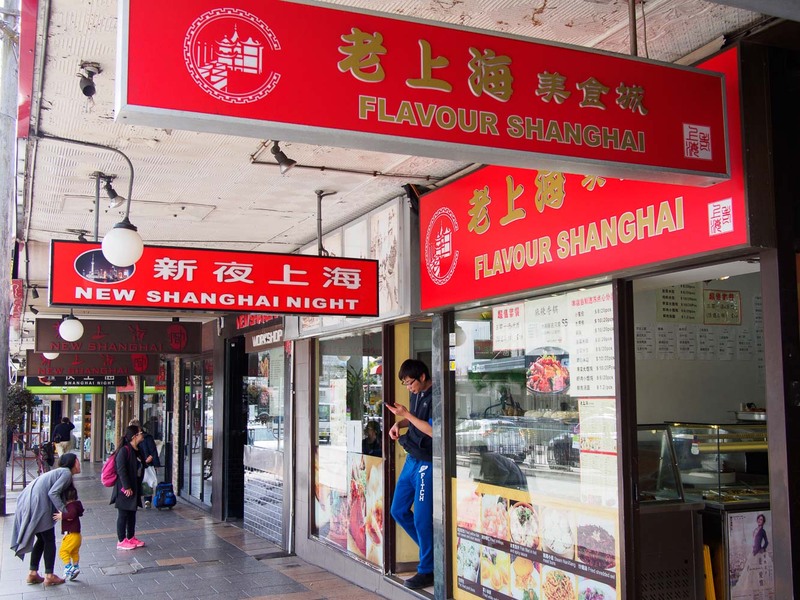 Flavour Shanghai is at 267c Liverpool Road, Ashfield. Ph: 9798 7721. 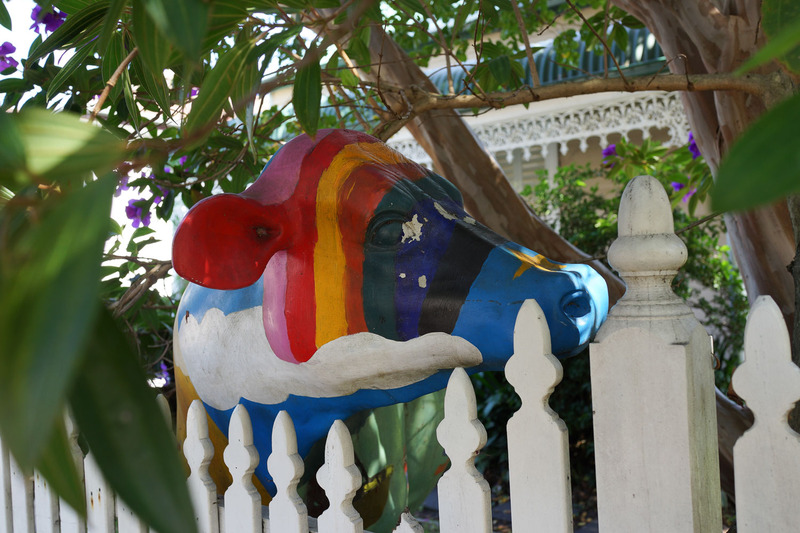 On our way to Ashfield we walked the backstreets, coming across this super cheery cow in someone's front yard. 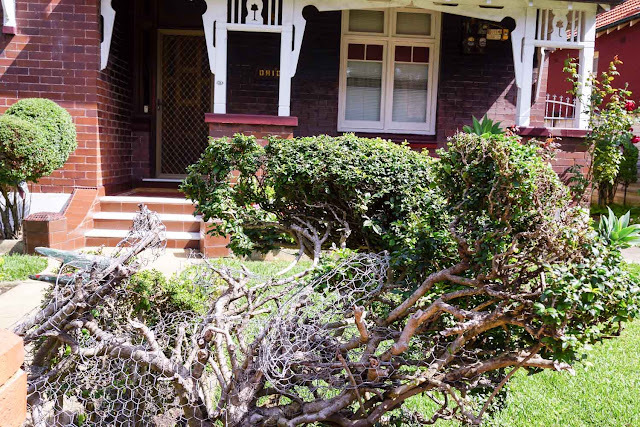 Our ultimate aim was to walk by Joe's 'Mad Monster Garden' in Summer Hill, which is sadly now not much more than the chicken wire used to create the masterpieces. This site shows it in its former glory. 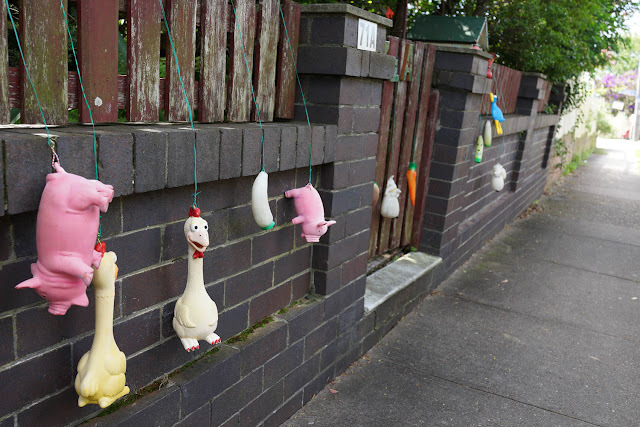 We just love the random stuff people decorate their houses with, brick fence adorned with dog toys. This must drive passing dogs mad. We love walking Sydney, finding noodle soup at the end is only half the fun.